Shigar was just our destination for the night – we’ll be back there for a couple of nights in a few days. The reason we stayed there on the way out was to break up the long trip from Gilgit to Khaplu, our farthest destination on the entire trip. After breakfast we had a quick tour of the Shigar Fort, which has a fascinating history as both the former seat of power for the Raja as well as serving as the royal residence. They have done an amazing job restoring the building, and it’s conversion into a luxury hotel has been done tastefully. It’s easily one of the most quaint, unique and romantic hotels I’ve stayed in, and I’m looking forward to coming back to relax here for a couple more nights after we’ve been out to Khaplu. The drive was a short one today, first back across the Indus River near Skardu and then heading east following the river further upstream. The Indus was more of a gentle giant along this stretch, meandering in slow esses down the wide valley with rock-strewn mountains above. Apart from the occasional lush green village it was quite barren and arid. After a couple of hours driving we reached another convergence of rivers with a dodgy suspension bridge to cross. If we stayed following the Indus (along here called the Sind) we would cross some 40km away over the Line of Control and into Indian Kashmir (Ladakh). In 2009 I rode a motorcycle along the Indus from Leh around Ladakh with my mate Guillermo, and it was nice to be able to almost join the dots now. We instead left the Indus and drove north-east into the Shyok river valley. An hour and a bit later and we arrived in the sprawling village of Khaplu nestled amongst terraced fields and orchards on the hill. 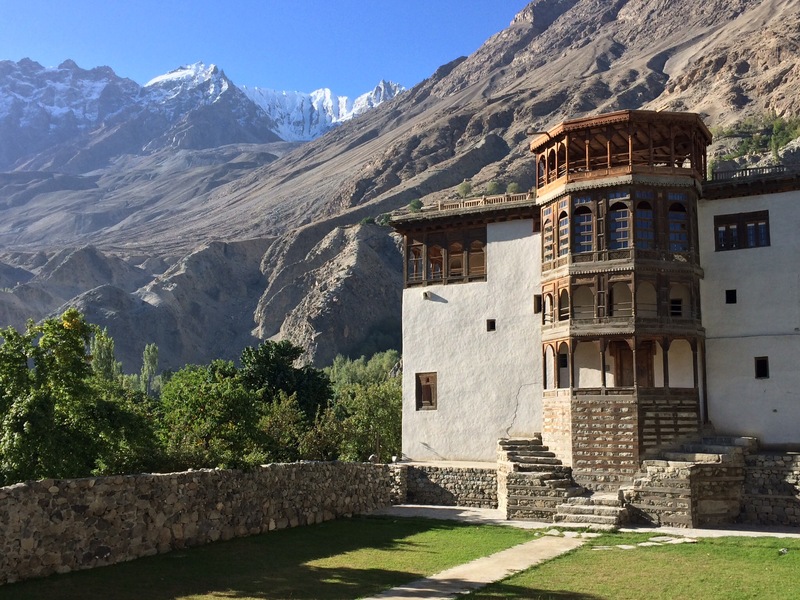 We drove towards the upper part of the village to the Khaplu Fort & Residence, which like the one in Shigar has been restored and converted into a luxury hotel. It seemed out of place to have such nice accommodation all the way out here, and it seemed like the hotel hadn’t seen any guests in a while! The hotel was a lovely collection of old restored buildings, and following a tour of the fortress-like royal quarters we sat on the balcony with some tea to watch the sun set over a really jagged ridge of granite peaks across the valley.